I think he’s the biggest talent outside the big three. If only he could get it together he could win three or four grand slams. Beat 3 top ten players to take this title! That’s massive! Yep, very good week indeed. I haven’t seen Kyrgios quite as focused as he was against zverev. The combo of his power serve and deft drop shots destroyed zverrev’s rhythm, and I don’t think zverev played badly, he was just monstered by the kyrgios’ serve whenever he had a chance to break. The test will be when he is losing to nicholas kicker on court number 23. Then we’ll see if he has matured mentally. They panned to his box & referred to Nick’s conditioning guy. Anyone know who this is & does he travel with Nick? Also, somehow Nick learned to volley this past month. He actually put together some decent approach shots and volleys. I doubt he taught himself, so there might be some informal coaching going on as well. We know it’s not Hewitt. Zverev was very gracious in defeat. 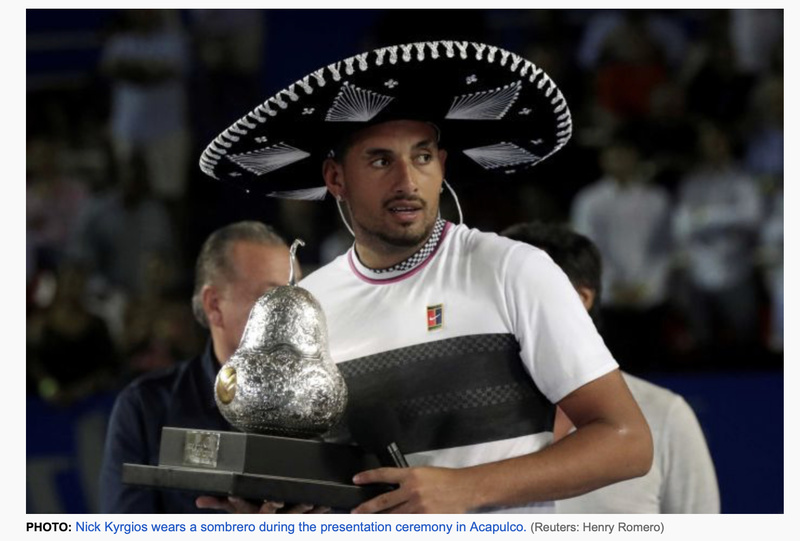 I think he knew he got beat fair and square and the Mexican crowd threw everything it could at Kyrgios to put him off. It is the most mentally resilient I have seen Kyrgios. This is the second 500 tournament won by Kyrgios - Next step is to go deep in a 1000 tournament - It’s obvious why Kyrgios doesn’t have a full time coach as he does his own thing - Better that he has a ‘sort of coach’ from time to time who can work on the tactical side of his game. Beat Nadal and Zverev - that’s an excellent effort. Who knows what he’s going to achieve by the end of his career. Probably more flashes of brilliance than continued dominance. He has the talent we know that. The mental attitude will always be the question mark. Kyrgios put together a great week and wins the tournament. Some big wins under his belt, lets hope he can take the confidence into the next tournament. I dont mind him carrying on a bit, starting a mexican wave, whatever works for him. Just play some good tennis, the talent is there. But yeh for grand slams - Fitness and return of serve still need to be worked on, they can be rectifiied a coach may help, and I’m sure there would be a cue of coaches wlling to help him. Maybe he just needs to watch a few David Goggins you tube videos and get a bit more driven. That bloke is a beast. Good interview with him & Joe Rogan recently. I get the feeling Kyrios is the type who doesn’t like being told what to do. That makes it hard to be coached. type who doesn’t like being told what to do. That makes it hard to be coached. yeh thats why i said May. He would have coaches falling over themselves to coach him, but he needs to find someone that might be the right fit. Yeh ive listened to it, its good. My mate who does ironmans has read his book and loves him. Nick could be anything however the only thing which prevents this happening is, himself. He is his biggest enemy. Kyrgios up now against Kohlscreiber at Indian Wells. Hopefully good Kyrgios is here because it’s a quality field. Kyrgios just smashed his first racket. Kohlscreiber takes the first set. Kohlscreiber too solid and Kyrgios barely out of first gear. Yep. Pretty poor effort there from Nick. Nick was seeded #31. Seeds get beaten regularly & both tsitsipas & demon who were seeded higher were also beaten today. I don’t think there’s a story apart from Kyrgios played well a week ago but couldn’t back it up. We need to assess Nick against the reality that he is in the top 40 tennis players, but not treat him like he is top 5 who don’t often lose. He looked very slow and cumbersome today and had no feel on his racket. And he doesn’t have the mental strength or understanding to pull himself out of a slump during a match. I thought he tried in the 2nd and kept his temper in check. Surface suited Kolscreiber more as well. He hits some beautiful backhand shots today that would have passed many. Would have liked Kyrgios to up his intensity more when things aren’t going his way.